The significant feature of Konstantinos Seremis` art is his dexterity to build a whole world out of nothing. The phenomenal important moment stamped in the optics of an unforeseen glance at reality exalts and sets boundaries to the imaginary element that uplifts simple things into sensational tools, in its nucleus. Konstantinos Seremis` work suspends between the real and the unreal, since everyday objects along with their occasional prosaic use, become a means of a poetic prosperity, in his hands. Especially nowadays, when the technological era, with its fast pace, has imposed a compulsion, as far as air perception of the world around us is concerned, the case of artists like Seremis, is useful because it serves as a guide and reminds us that these are various ways to perceive reality and its heavy realism. 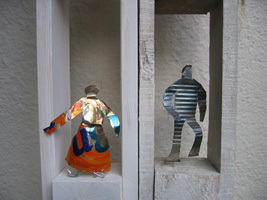 His figures, deliberately made up of everyday materials such as the beer or orange juice aluminium cans appropriate to themselves and play a totally different part from what they were originally made for. This, in itself, is extremely revolutionary due to the fact that Seremis employs his imagination to penetrate an established industrialised form converting it into a picture of his own quest. Warning material from tins he molds and creates an array of human figures with the desire to present his own inner sentimental world, by means of immobilising the moment of their construction while transferring us to his own ecosystem. They come to life and they reveal their secret dimension in front of us, which, being truly multidimensional, becomes unique to every single observer. This is why I mentioned, above, that Seremis manages to mold whole worlds on their own, with the originality of his imaginative intuition, since every observer, separately, derives the magic that every different perspective creates. I am truly impressed by the way the artist makes use of the most worthless materials in order not only to add value to them but also to rebuild them in an ideal artistic place while saving them against their complete non – existence. His cosmogonic tury to worthless material as a mean of expression has been a great surprise to me, indeed. And, I think this is where the magic of his work lies – his ability to reach the boundless starting from the very least and, at the same time, accomplish everything based on nothing.